This photo from the Old Schoolhouse Museum in Mary Esther, Florida, evokes all kinds of images. I can see an eight year old girl wearing a sunbonnet and swinging her tin lunch pail as she walks to school, laughing with her friends along the way, the sun warm on their faces. What, with no refrigeration, in the days before the thermos and the invention of waxed paper, aluminum foil and plastic sandwich bags, did the lunch pail contain? Contemporary accounts talk about cornbread with syrup, bread and lard with a little sugar, fresh fruit, nuts, a wedge of cheese, dried beef jerky. Often, the lunch was based on left-overs from the day before and reflected the ethnicity of the family, perhaps Irish, Italian, German or Swedish. Peanut butter wasn't invented until the 1890's, so for most of the nineteenth century no peanut butter and jelly sandwiches ( a personal favorite of mine)! The children drank water from a dipper out of a bucket. The water had to be carried from the nearest well or the children took turns at pumping it up from the well in the schoolyard. Food was wrapped in a handkerchief or a piece of cloth. If parents could afford it, they purchased a tin lunch pail. If not, an empty cookie or tobacco tin was put to use. Commercial, decorated lunch pails, so popular in the 20th century, hadn't been invented yet and the public school lunch program wasn't instituted until the 1940's. For references and additional reading, see the Extras tab. Today, the word "dunce" refers to a dull-witted, stupid person, incapable of learning. A dunce cap was usually made of paper and schoolchildren were forced to wear it as punishment for being stupid or lazy. The term "dunce" derives from the name of a person: John Duns Scotus. He was a very influential philosopher-theologian of the High Middle Ages who lived from 1266 to 1308. He advocated wearing conical hats to increase learning similar to those worn by wizards. As so often happens over time, the teachings of Scotus fell out of favor and were ridiculed and despised. The conical hat became a symbol of ignorance instead of a symbol of learning. By 1577, Scotus's name had been transformed into "dunce". The first recorded reference was a "dunce table" provided for duller or poorer students in the 1624 play "The Sun's Darling" by John Ford. The term "dunce cap" appeared for the first time in the 1840 novel "The Old Curiosity Shop" by Charles Dickens. 12. To keep the schoolroom neat and clean, you must: sweep the floor at least once daily, scrub the floor at least once a week with hot, soapy water, clean the blackboards at least once a day, and start the fire at 7 a.m. so that the room will be warm by 8 a.m. Fascinating photos of the discovery of King Richard III's skeleton under a car park in Leicester, England, showed that the king suffered from severe scoliosis (curvature of the spine). Check out this link: http://www.telegraph.co.uk/science/science-news/9846693/Richard-III-skeleton-is-the-king.html. The truth is we didn't know what caused scoliosis back then and we still don't know what causes the most common form today. Treatments in the 19th century and early 20th century included exercises for strengthening the back muscles, casts and braces and combinations of traction, suspension, bracing and postural corrections. Today, the treatment consists of braces to prevent further progression in children who are still growing and spinal fusion surgery for those whose bones have completed the growth process. 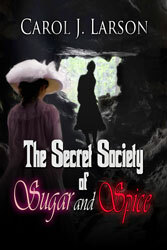 My next book, The Secret Society of Sugar and Spice, should be available soon in e-book format and as a print paperback. More info to follow. Her name is Mace. Like the spice. And the weapon. At sixteen, she is the leader of the Secret Society of Sugar and Spice, a group of girls who are inmates of the Home for Abandoned and Orphaned Children and whose lives are only made bearable by their mission to rescue runaways from the streets of St. Paul, Minnesota. But now, in 1883, when the Secret Society is called upon to rescue Claire Sargent, a rich privileged girl who is being abused by her stepfather, their world is turned upside down and nothing is what it seems. When Mace’s father reappears at the Home and a gang of thugs searches for Claire, Mace, too, becomes a runaway and flees into a world where she must learn that enemies can become friends and hatred can turn into forgiveness. "The goal of Indian education from the 1880s through the 1920s was to assimilate Indian people into the melting pot of America by placing them in institutions where traditional ways could be replaced by those sanctioned by the government. Federal Indian policy called for the removal of children from their families and in many cases enrollment in a government run boarding school. In this way, the policy makers believed, young people would be immersed in the values and practical knowledge of the dominant American society while also being kept away from any influences imparted by their traditionally-minded relatives." 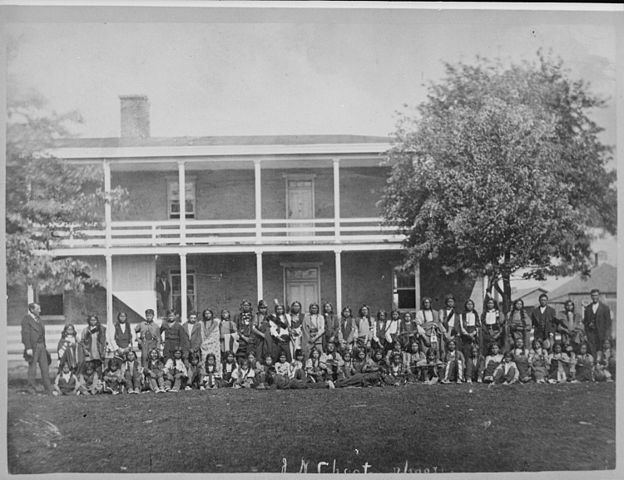 The photograph above shows a group of Sioux Indian boys as they were dressed upon arrival at the Carlisle Indian School in Pennsylvania in 1879. It was common to take "before" and "after" photos to show the public the civilizing effect of the boarding school on the children. By the 1920's, the government changed its policies and Indian children were educated in local public schools.